Last night The Walkmen played the 9:30 club, it was a triumphant homecoming for the DC natives and graduates of St. Albans High School. Hamilton Leithauser playing an electric guitar on the first song, and throughout the set would occasionally strum on an acoustic, but mostly stuck to singing. Leithauser’s vocals were the most surprising thing of the night as his howling was actually pitch perfect. Songs such as “On the water” were spooky and reminiscent of Halloween. Other songs such as “In the new year” were uplifting, and the juxtaposition of spooky songs and hopeful ballads made for a very diverse set list. They are traveling with a horns section, one of whom Hamilton introduced to the crowd as his wife Anna. This addition of sound made certain songs richer. On stage Leithauser is calm and confident, and you can tell these boys have spent some time on the circuit before, because their live performance is tight. Paul Maroon's chops on guitar were spell binding, and the tunes set a mood as opposed to really rocking out. 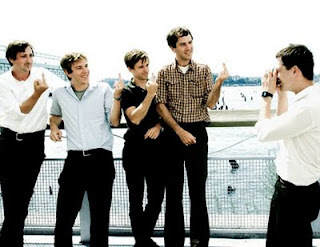 The Walkmen are a class act, be sure to check them out.